However, it’s not enough to just talk about these benefits, which is why we’re adding some real-world examples to give you an idea of how testimonials can have a positive impact on customers. When implemented correctly, testimonials can convince a customer to make a purchase. A study from Northwestern University showed that putting relevant reviews with a product increased conversions dramatically. Showing at least five reviews increased the purchase likelihood by almost a factor of 4x. The study also revealed that the first 5-10 reviews determined if the customer made a purchase, which makes it even more crucial that you make testimonials a major centerpiece when someone makes a purchase decision. Take a look at the example below, which highlights reviews of a carpet cleaning business. 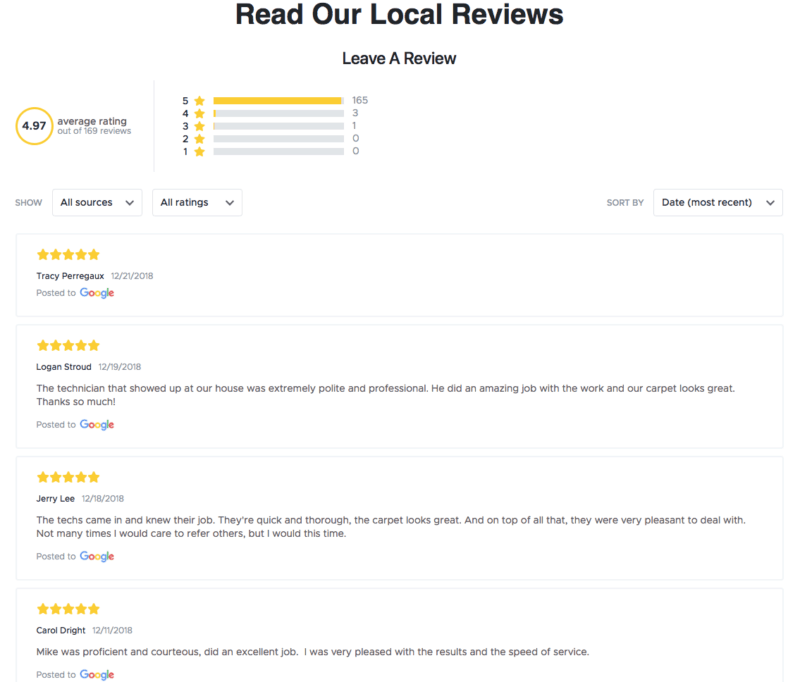 At a glance, these reviews offer proof that the company’s service is trustworthy, but a closer look reveals that the reviews touch on a specific aspect of the customer experience: the professionalism and friendliness of every technician who visits each customer’s home. By visiting a website, customers already show interest in the product or service offered and showing reviews with specific details about the customer experience can be the final push needed to make a purchase. Testimonials need to show not just praise, but specific details as well. The text of a testimonial can help drive conversions, but testimonials can also include ratings, which can actually improve your SEO performance. The main link between SEO performance and reviews is review schema markup code. Implementing these specific lines of code on first-party reviews (reviews written and submitted on the business’s website) helps search engines like Google easily find reviews on a website. Garner enough first-party reviews and ratings, and you’ll soon see your search engine results page (SERP) entry come with an overall star rating and the total number of first-party reviews on the site. For example, the image above shows a SERP entry for a blog post on how to boost a business’s online presence. People who read the article had the option to rate it at the bottom of the page. These ratings are marked with review schema. Google then saw the review data and added it to the SERP entry. Having review data, like a rating and the number of votes, on a SERP entry can make it stand out from other material on the results page, which makes it more attractive to customers. However, the work doesn’t stop there. You need to encourage customers to leave reviews on the website on a regular basis. A steady flow of reviews shows Google that new content is frequently added to the site, which can increase its SERP ranking and further drive traffic. Adding review schema markup and implementing first-party reviews on a website can be tricky at times, especially if you have little to no experience with coding. Fortunately, there are some great review widgets that can automate the process and make it easy to post reviews. Customers want to hear from other people to get a genuine idea of the business before they make a decision. Testimonials are a great tool to use in this scenario because you’re selecting specific reviews that will convince someone to convert. 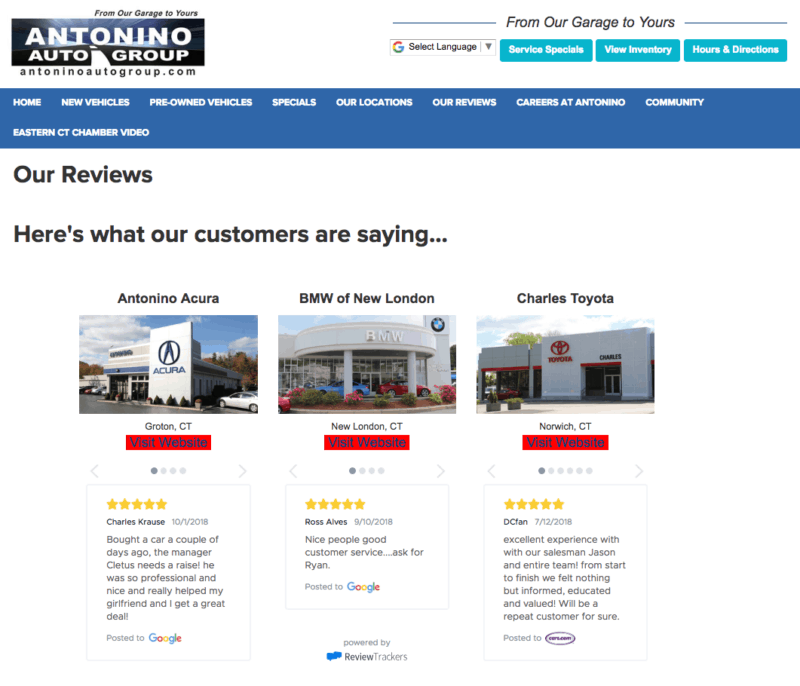 Just like the carpet cleaning reviews, the testimonials below for multiple auto dealerships were not randomly selected by the company. They were picked to show future customers that the interaction with the sales team wouldn’t be intimidating. Reviewers used terms like “professional,” “top-notch,” “informative,” and “great personality” to describe the salespeople that they met. Testimonials establish trust for potential buyers. They show that real people actually tried the product or service and they had a great experience with it. In a way, it’s free marketing so make sure it’s somewhere where everyone can see it. The easiest way to get testimonials is by asking customers for reviews. However, it’s not enough to just find the best reviews and post them on a website. You also need to respond to reviews and strive to improve the experience for future customers. Only through constant engagement and overall business improvement based on customer feedback can you get more reviews, and more importantly, amazing testimonials from both recurring and new customers.